A view of the lunar eclipse from Japan's northernmost main island of Hokkaido on Aug. 28, 2007. 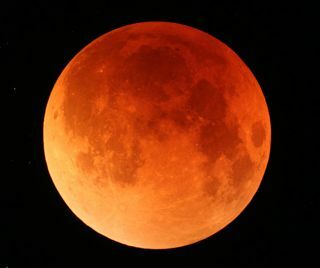 The Earth's shadow crept across the moon's surface slowly eclipsing it and turning it to shades of orange and red during second total lunar eclipse this year. As ifscanning the moon's surface for impact blemishes were not enough, NASAnow plans to visualize its internal imperfections to solve longstanding mysteries about the moon's insides. NASA saidthis week that it selected the Gravity Recovery and Interior Laboratory (GRAIL)mission from two dozen proposals. GRAIL's twin spacecraft are slated to launcharound Sept. 6, 2011 and, after a few weeks of settling into orbit, map thelunar gravity field for 90 days. Scientistshope to use the data to pick apart its insides from crust to core, much like a medical X-ray that shows the insides of a person. "We'relooking forward to the data," Michael New, GRAIL's lead project scientist,told SPACE.com. "It's really going to open up new understandingof the particular history and internal structure of the moon." NASApreviously launched a mission to map Earth's gravitational fields, calledGRACE—the Gravity Recovery and Climate Experiment. Over the years, it measured minutedifferences in gravitational pull at different points around our planet,revealing glacial melt, migrating magma and tectonic plate movement, among othercuriosities. Similarly,GRAIL will measure gravity at different points around the moon, which shouldreveal any gravity differences as slight as 1 million times weaker than theEarth's overall gravity. New saidthe data will be about 1,000 times better than any other measurements of lunargravity, explaining that such data can be processed to peer beneath the moon'ssurface and locate any significant structures related to early lunar history. "We'retalking about things like relaxation of lunar crust to ? a big lava flow,"New said. "The other thing that may become a little clearer will be alittle bound on the size of any lunarcore, if there is one." GRAIL beat out23 elaborate competitors in NASA's Discovery mission selection process, andwill cost at least $375 million for the whole package—design, launch andstaffing included. "GRAILalso offers to bring innovative Earth studies techniques to the moon as a precursorto their possible later use at Mars and other planets," said Alan Stern,NASA's associate administrator for science, at this week's American GeophysicalUnion's 2007 meeting. New saidthe money is set aside in NASA's budget, which means intricate engineering ofGRAIL's twin spacecraft can begin. "Themoney's there," he said. "Unless something really horrifichappens—like another Katrina—we have money in our budget to support mission allthe way out." The LunarReconnaissance Orbiter (LRO), set to launch in 2008, willprecede GRAIL's spaceshot. LRO will scan the moon's pockmarked surface forfuture robotic and human landing sites and will be accompanied by anotherspacecraft, called the Lunar Crater Observation and Sensing Satellite (LCROSS)mission—which will impact the lunar south pole to search for polar water. "AsNASA moves forward with exploration endeavors, our lunar science missions willbe the light buoy leading the path for future humanactivities," said Jim Green, NASA's planetary divisiondirector in Washington, D.C.
LockheedMartin Space Systems in Denver will build GRAIL and NASA's Jet PropulsionLaboratory in Pasadena, Calif., will manage GRAIL's mission.